By clicking the “Add a filter” button (see circled above), select a filter type and enter the criteria. Once that filter is created, click to get instant access to what you need right away. 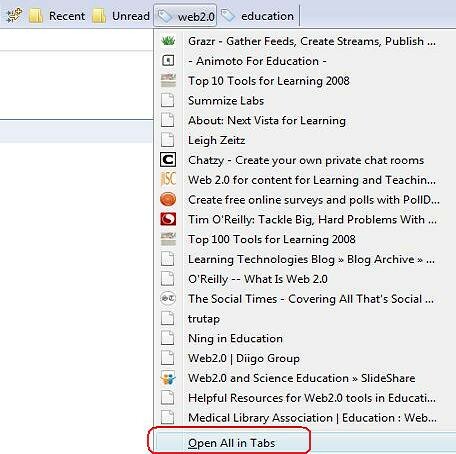 You can even use “Open All in Tabs‘ to open up all webpages at once. You can re-arrange the filter buttons by drag and drop. To remove a filter, just right-click, and click the pop-out “Remove this filter” to confirm the deletion action. 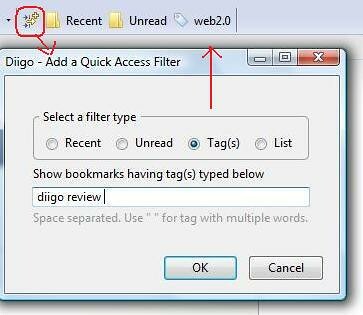 Lastly, just like any of the Diigo toolbar buttons, you can access & customize what you need on the toolbar by opening up “Options” on the toolbar. See here for more detail. Please give the new “Quick Access Filter” a try, and let us know what you think. Next > Announcing "Diigo Educator Accounts"
It’s really nice, and I would have used it extensively if not for the fact that I can’t sort items on the pull-dowd lists. The default “Recent” and “Unread” filters work well enough sorted by added-time, but not regular tag filters, IMHO. Understand. If sorting is very important to you, use a list filter! First pull up the links with desired tag and you can selectively add what you need to that list. Within a list, you can re-arrange the order of the links any way that you like. Lastly, create a list filter, then you get the best of both worlds – instant acess and order sorted the way you wish. Cool! Diigo gets better and better.